"Girl Defies Death, Houdini Marvels"
Houdini wants to know how it was done. And by the way, Mr. Houdini, the handcuff king, was at the Hippodrome in Cleveland a week ago and mystified all the folks who saw his performance. 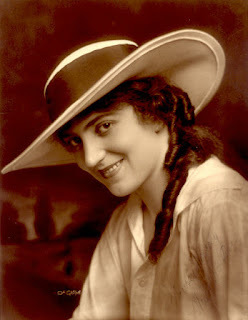 Helen Holmes, a movie picture actress with the Kalem Company, who is appearing in the film, "Hazards of Helen", has duplicated Houdini's stunts. Recently, she was thrown into the rough and choppy waters of San Pedro harbor, California, with her hands and feed tied. She escaped and met her sweetheart on the bank of the big stream just as the scenario said she must. Miss Holmes has worked for more than a year on the trickery of escaping bonds. She has shown most of these in her moving pictures, which are the most daring of the kind ever exhibited. So who was Helen Holmes? Well she was a silent movie actress from the Illinois born in 1893. She began making movies around 1912. As the Perils of Pauline serial began to take off, the Kalem film company decided to do a similar serial of their own starring Helen Holmes. Her films were somewhat different than the cliffhangers of the Perils of Pauline. Many of her films had Helen herself escaping her bonds or freeing herself rather than being rescued by someone else. Given the time period in history, I kind of wonder if she did in fact do the escapes. She was known to perform her own stunts, so it's possible. Below is a video of a typical Damsel in Distress shot from a movie. This is Helen Holmes in action. It appears she was doing these harrowing escapes in the movies before Houdini made his first film. What do you think the chances are that Houdini's escape act inspired the whole 'damsel in distress' concept. Meaning, being in dangerous predicaments, not implying Houdini was any sort of damsel. Ah, thanks Joe, I hadn't seen that, obviously, lol.